The survivors of Bhopal gas disaster today staged a demonstration at Parliament Street, demanding justice, rehabilitation and life of dignity. “We will stay in the Capital till our demands are met,” says Rashida Bi, who by virtue of being involved with the fight since the beginning, is a well-known name nationally as well as internationally. The race for six Rajya Sabha seats from Bihar has taken an interesting turn because it is the NDA which is likely to decide the fate of either of the UPA candidates, RJD and LJP, for the sixth seat where a possible cliff-hanger contest has kept both Mr Lalu Prasad and Mr Ram Vilas Paswan on tenterhooks. Tamil Nadu Chief Minister J. Jayalalithaa stuck to her own guns and did not spring any surprises while she released the names of nominees for the May 8 Assembly elections in the state here today. Had the Department of Income Tax its way, it would have asked thousands of income tax assesses of the Capital to go to Allahabad in UP for settlement of disputes. The CPM party secretary in Bengal, Mr Anil Biswas, who died yesterday at a city nursing home, had his last journey today as the politburo and the party’s state leadership held discussions about appointing his successor in which Mr Jyoti Basu, Mr Prakash Karat, Mr Buddhadeb Bhattacharjee and Mr Sitaram Yechuri participated. The allegations of kickbacks in the Scorpene submarine deal have sent shock waves at Mumbai’s Mazgaon Docks Ltd. (MDL) where these are to be built. Minister of Science and Technology Kapil Sibal today called for stepping up research in biotechnology and nanotechnology while admitting that the government was slow to respond to the needs of these sectors. Kanchi Shankracharya Jayendra Saraswati, whose case was transferred to Pondicherry last year by the Supreme Court, today moved a petition before it for change of prosecutor. The CBSE has decided to conduct a re-examination on April 8 for around 2,500 Class 10 students in the national capital whose science and technology answerbooks were gutted in a fire here last week. The March 29 total solar eclipse will be visible in India partially from certain areas. It will be visible in the country as partial eclipse from areas covering north-eastern region, northern as well as Central India and north-western parts of the country, an official note today said. Demand to cancel allotments of liquor shops in wake of leakage of excise policy in Dehradun. Indian Air Force fighter jets dazzle the skies. Mika launches new album after a gap of two years. The 39 survivors of the World’s worst industrial disaster, who walked for 33 days to cover the 800-km distance between Bhopal and Delhi, were today joined by other supporters. Fifty-year-old Rashida Bi confirms that their fight has now gone beyond monetary compensation, adding, “We are not 'bhikaris' who will negotiate on our fundamental rights”. Rashida Bi has lost seven members of her family in the disaster. They have appealed to the Prime Minister to intervene into the matter. She says the survivors will start a fast unto death here next month till their six-point charter of demands was met by the government. 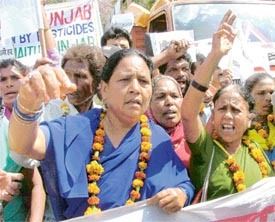 Their demands include setting up of a national commission on Bhopal to oversee medical and social rehabilitation of the victims for the next 30 years, supply of safe drinking water, speedy prosecution of the accused, including Union Carbide Corporation and its former chairman, environmental remediation, a ban on Dow Chemical and its subsidiary Union Carbide’s business in India among others. “It is unfortunate that the consecutive governments have continued to treat our survival issues so casually. We are tired of repeating the demands and will leave Delhi only after all our demands are fulfilled,” said Goldman award-winner and survivor-activist Champa Devi Shukla. Incidentally, Champa Devi was part of a 100-women delegation that marched from Bhopal to Delhi in June 1989 to meet the then Prime Minister Rajiv Gandhi. Meanwhile, the Prime Minister's Office and UPA President Sonia Gandhi’s office have assured them of an appointment before March 31. The agitators were also joined by representatives from a pollution-impacted community in Daurala, students from Delhi University and JNU, and NGOs, including Kheti Virasat Mission of Punjab. What is troubling the survivors is that Bhopal is sitting on the site of second disaster with more than 20,000 persons being forced to drink contaminated water despite a May 2004 Supreme Court order directing the Madhya Pradesh Government to provide them clean water. In 2001, a scientific study found high levels of toxic contaminants, including mercury, in mother’s milk in the residents of 16 colonies that are in vicinity of the ill-fated factory. A large number of children in these colonies are still born with deformities. Election to six upper House seats is scheduled on March 29. Chief Minister Nitish Kumar, who shepherded both his party and NDA to victory at the October-November Assembly polls by grounding the apparently invincible Lalu Prasad, already extended a tactical support to the LJP by thanking Mr Ram Vilas Paswan for all but ensuring the defeat of the second RJD candidate on the sixth seat, which is an open one. Out of the six vacant seats, while the NDA is all set to comfortably bag four seats through first preference votes based on the strength of its 142 MLAs (JD-U 88 and BJP 54), the RJD is certain of winning one seat in view of the presence of its 54 MLAs. In the 243-member Bihar Assembly, every winning candidate for the RS seat would need first preference votes of 35 MLAs, failing which the second preference votes would be taken into consideration. The RJD has fielded Rajniti Prasad as its second candidate for the sixth seat, against LJP’s vice-president, Ranjan Yadav, one time trusted lieutenant of Mr Lalu Prasad, who later on allegedly attempted a coup to dislodge the government headed by Rabri Devi. The combined strength of UPA in the House is 65 (RJD 54 ,Congress 9,CPM 1 and NCP 1) and after the 35 first preference votes being cast in favour of RJD‘s first candidate Jabir Hussain, the second candidate, Rajniti Prasad is left with 30 votes, short of five first preference votes. Against this, the LJP has already secured the support of five CPI-ML MLAs and three CPI MLAs .The four BSP and two SP MLAs are also said to be in favour of LJP .The LJP’s own strength is 10 in the house. The LJP, based on the above calculations, expects 24 first preference votes. As both the second candidate of RJD and LJP are short of the required 35 first preference votes based on their respective committed votes, the support of 11 Independents is crucial in this context. Both RJD and LJP are trying to woo them to tilt the balance its favour. And here the NDA is expected to step in. The NDA has two surplus first preference votes from BJP’s account and added to this, four out of 11 Independents from the very first day were supporting the NDA thus making the total surplus first preference votes of NDA to six. The reported six surplus first preference votes of NDA can increase the tally of LJP from 24 to 30, which can evenly balance the game between RJD and LJP. The NDA is also understood to be in the process to influence the rest seven unattached Independents to vote in favour of LJP. Above all, in case second preference votes comes into consideration, against 142 second preference votes of NDA, there are only 65 second preference votes of UPA. The anxiety over NDA calling the shots on behalf of LJP to ensure the defeat of RJD was evident on the face of Mr Lalu Prasad when he addressed the media here today. While appealing to all secular parties, including BSP, CPI and CPI-ML, not to side with LJP, Mr Yadav alleged that Mr Ranjan Yadav was virtually the second candidate of BJP. “I wonder how CPI, CPI-ML and other secular parties can vote for LJP, which is being promoted by BJP,” he claimed. Apprehensive of possible defeat Mr Lalu Prasad earlier had reportedly approached Mr Paswan promising support for LJP in the sixth seat if Ranjan Yadav was replaced by any other candidate. But Mr Paswan disagreed to the proposal. As the role of NDA is expected to be crucial to decide the fate of either of UPA candidates in the sixth seat, the possible cliff-hanger contest between RJD and LJP has again exposed the bitterness between Mr Lalu Prasad and Mr Ram Vilas Paswan much to the satisfaction of Mr Nitish Kumar. On his part, Mr Lalu Prasad faced a “mini revolt” in the party over the selection of second candidate as senior leader Shivanand Tiwari withdrew himself from the contest when he was chosen as second candidate against Jabir Hussain. Barring any last minute unexpected development in favour of RJD, Mr Tiwari’s retreat perhaps vindicates Mr Nitish Kumar’s calculations on LJP to force Mr Lalu Prasad to bite the dust again after October-November polls. So the fight for the sixth seat finally boils down to an ego tussle between Mr Nitish Kumar and Mr Lalu Prasad after NDA completed 100 days in office recently. The five sure winning candidates are Ali Anwar, Mahandra Prasad and Mahendra Sahni of JD(U), Ravishankar Prasad of BJP and Jabir Hussain of RJD. As was expected, she is contesting from the Andipatti Assembly constituency, where she had contested last time and won with a record margin. She has allocated the safe seat of Madurai to her party presidium’s chairman and former speaker K. Kalimuthu. Former Chief Minister O. Panneerselvam, who became the Chief Minister when Ms Jayalalithaa was in jail and was briefly disqualified in 2001, will be contesting from Periyakulam, which is very much part of the backward Thevar caste belt in south Tamil Nadu. The constituency is a vote bank of Ms Jayalalithaa. Though the Dravida Munnetra Kazhagam (DMK) is yet to release its candidates’ list, its supremo M. Karunanidhi is all set to contest from Triplicane in central Chennai. But then he will face a tough fight in Ms Badr Sayeed, a schoolmate of Ms Jayalalithaa, who belongs to the minority Muslim community, which has a sizable population in the constituency. Ms Sayeed had lost during the last parliamentary elections from south Chennai to Mr T.R. Baalu, Union Minister for Port and Shipping. A famous Tamil actor and dramatist S. Ve Shekar, an All-India Anna Dravida Munnetra Kazhagam (AIADMK) activist, will contest from the Brahmin dominated constituency of Mylapore in south Chennai. He had fought against the same party in the past and polled more votes against a man who went on to became the number two in the Jayalalithaa Cabinet. It is now clear that Ms Jayalalithaa is focusing her attention on south Tamil Nadu, which is her vote bank and spending a lot of time there. But its legal adviser shot down its proposal leading to idling of avoidable expenditure of over Rs 50 crore for acquisition of ready-built accommodation at Ghaziabad and other places. In response to the audit observations, the ministry stated last month that the entire building had been allotted to the DG (Systems) for establishing the National Computer Centre. This underscored the point that the building could not be utilised for the purpose for which it was acquired and the legal implications were not examined before its purchase. Substantial portion of the building continued to remain out of use till December, 2005. The department also incurred additional expenditure of Rs 1.23 crore, noted the CAG report, on the maintenance of unoccupied building between March, 2003 and February, 2005 and continued to incur expenditure of Rs 5.74 crore per annum on rent and maintenance of other hired and unoccupied buildings beyond February, 2005. The CAG noted that the Ministry of Finance (Department of Revenue) accorded administrative approval and financial sanction in 1996 for the purchase of ready-built office space measuring 15,000 sq m at Vaishali from the GDA at a cost of Rs 19.94 crore. Reason, because its Standing Council advised against it on the grounds that besides causing inconvenience to the assessees, it would create legal problems as the Delhi-based assessees under the territorial jurisdiction of the Delhi High Court would have to approach Allahabad High Court for the settlement of disputes. The report noted that this happened despite CBDT’s instructions to the department to examine the implications in the light of income tax laws before going in for acquisition of the property in a bordering state. In another case, the CAG noted that the India Government Mint, Noida, under the ministry, constructed 96 staff quarters without properly assessing its housing need, resulting in 58 quarters (60 per cent) remaining vacant and consequential idling of investment of Rs 2.29 crore. House rent allowance of Rs 43.51 lakh was paid to the staff for whom the quarters had been constructed and there was a loss of licence fee of Rs 5.63 lakh as well. Some of them later took part in the procession carrying Biswas’s body from Alimuddin Street’s party office to NRS Hospital near Sealdah, where the body was handed over to the hospital authorities as desired by the late leader for carrying out research work by medical students. His eyes had already been donated last night. Four names were discussed as Biswas’s successor. They are Mr Biman Bose, Politburo member and the Left Front chairman, Nirupam Sen, the state Industries Minister, Benoy Konar, a senior leader and the central committee member and Madan Ghosh, the second man in command of the late Biswas. Amidst demands by the Opposition to scrap the deal, employees at the MDL are afraid that the ailing defence establishment will be in a deeper mess if the deal is scrapped. MDL’s submarine building facilities were mothballed for over a decade as no orders were received from the Indian Navy. The proposal to build six Scorpene submarines here was therefore seen as a major lifesaver for the company. Sources say engineers and technicians with specialised skills were brushing up their skills for the Scorpene project before the controversy broke. Senior employees on the verge of retirement were also hoping to pass on their skills to their subordinates while at work on the submarines. The deal is worth Rs 5,888 crores, including sub-contracts to private companies. The MDL has the country’s only submarine production line commissioned when the HDW submarine deal was signed by the Rajiv Gandhi government in the 1980s. After the deal collapsed, the assembly line was used only for the maintenance of the Navy’s existing fleet. Sources say most of the 4000-odd employees of the MDL have been sitting idle for more than a decade. During its heyday, the MDL had 16,000 workers. The Indian Navy is already beset by an ageing fleet that threatens to impede its preparedness. Of the 16 submarines in its fleet, the youngest is 15 years old. While two have reached the end of their life, the rest will be decommissioned in phases from 2010. Experts feel that the next four to five years will be crucial since it will take this much time for the induction of the new submarines into the fleet. India needed to launch an intensive and aggressive political movement that can bring about the required alliance and convergence between bio and nanotechnologies to make the country a leader in harnessing its natural wealth in sectors like agriculture, horticulture and manufacturing, he said. “It is necessary to support fundamental research in each area along with a convergence of various sciences. I believe our government and bureaucracy is slow to respond to the needs of research,” said Sibal addressing the Assocham Millennium Knowledge Summit IV organised by the leading industry lobby. Attended by a large scientific community, including from the US and China, the key speaker at the summit was Nobel Laureate Harry Kroto who, in his address, highlighted that nano science had the potential to reduce costs with its multiple applications and the inherent ability to produce new materials like non-corroding and flexible iron. Defence Minister Pranab Mukherjee called for a ‘strong interface and closer interaction among the research and development laboratories, academia and industries for taking science and technology outcomes to the masses in the form of home grown technologies and products’. Underlining the need for commercialisation of research, Director General of the Council of Scientific and Industrial Research R.A. Mashelkar said the real challenge lay in looking beyond the existing technologies and their applications as research in both biotechnology and nanotechnology was still at an early stage. Shankracharya, facing trial in temple official Sankararaman murder case, sought the change of the public prosecutor stating that after transfer of the trial from Tamil Nadu the Pondicherry, the prosecutor should be from the Union Territory itself. A Bench of Mr Justice Arun Kumar and Mr Justice Tarun Chatterjee directed the Tamil Nadu Government to file reply to his petition within two weeks. The main ground raised by the Seer is “fairness” of trial proceedings in the case, which was transferred to the Union Territory after the apex court had allowed his petition pointing out various acts of “commission and omission” by the Tamil Nadu Police in investigation and prosecution. Sankaracharya moved the apex court after Madras High Court had rejected his petition for changing the prosecutor appointed by the Tamil Nadu Government. Former Attorney General Ashok Desai, appearing for the pontiff alleged that Tamil Nadu Government was adopting the same tactics and there was reasonable apprehension that he would not get fair trial if the same prosecutor continued to pursue the case. The students will also have the option of accepting the average marks in the best of three subjects and the board has identified 20 examination centres in south Delhi as “affected” where students from several schools had appeared. The eclipse begins in Kolkata at 17:02 hrs and ends at 17:45 hrs, in Lucknow it starts at 16:41 hrs and ends at 17:58 hrs, Patna — 16:49 hrs and 17:56 hrs, Raipur — 17:05 hrs and 17:35 hrs, Ranchi — 16:56 hrs and 17:48 hrs and Srinagar 16:21 hrs and 18:10 hrs. The issue of office of profit, which so far was confined to filing of the petitions with the President and Governors today took a new turn with, the Delhi High Court issuing notice to BJP Deputy Leader in Lok Sabha V K Malhotra on a petition alleging he had furnished incorrect information about it to the Election Commission (EC).